Adult Round (Ages 13 & Up). Valid for one round. Must present emailed receipt as proof of purchase. Price reflects discounted rate available for rounds purchased online only. Child Round (Ages 4-12). Valid for one round. Must present emailed receipt as proof of purchase. Children must be accompanied by an adult. Price reflects discounted rate available for rounds purchased online only. 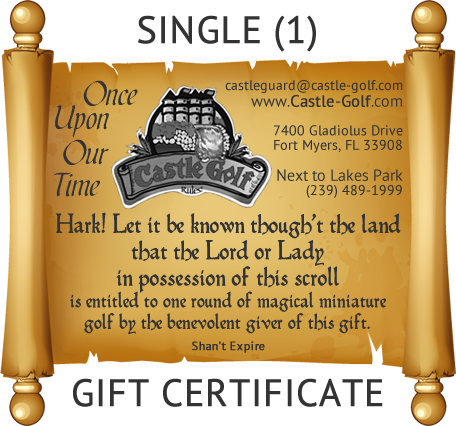 Single Gift Certificate (use if purchasing certificates in quantities less than 4). Must provide gift certificate at time of play. Children must be accompanied by an adult. Sent U.S. Mail - allow 10 days from date of purchase to receive (mailed within continental United States only). Non-refundable. Price includes shipping and handling. 4-Pack Gift Certificates (Buy 4 and get $1.00 off each certificate). Must provide gift certificate at time of use. Children must be accompanied by an adult. Sent U.S. Mail - allow 10 days from date of purchase to receive (mailed within continental United States only). Non-refundable. Price includes shipping and handling.